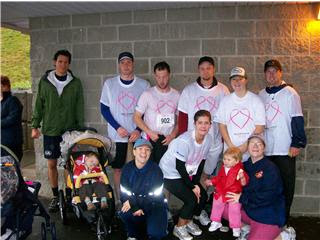 This was the 6th year in a row that my family has participated in this run. Wow, it was 7 years ago now that my mom was diagnosed with breast cancer. The run was very different this year because it was dark and very rainy. It is usually a very positive atmosphere but today, it was not. I also felt really sucky because I didn't run it. I strained my hip flexor (sp) in football yesterday so thought it would be best to take it easy. Gary had a great run with Kai in the jogging stroller. I'll attach a team photo once I get it from my sister. After the run we went out for lunch with the whole family (wow, 12 of us!) celebrate Trisha's 21st birthday. We did have to wait about an hour all together for our food but the two little ones behaved nicely, phew. What else this weekend? Saturday was busy as I had a football game in the morning (which we won by a crazy score of 2-1!). It was a good game in that we had to work really, really hard. I've got a lot of strange bruises to prove it too. In the afternoon I went with my sister to buy her wedding dress, I love it and it suits her so well! After that, Gary and I went to pick up our `new' great room rug. Our house requires us to be minimalists and it really kind of stresses me out the way our living room area looks, so, I thought the new rug might improve things. The real problem is my recliner. I love it, but, it takes up half our house. I paid some good money for it, so, I don't want to get rid of it. I know I sound so weird complaining when I have so much stuff to be thankful for and it seems so trivial, but, its something that has bothered me for over a year now and when you spend most of your time in that room, you want it to be functional and look nice too. I just wish that I could magically come home from work one day and there would be a $2000 makeover to our great room. Aren't I so selfish and vain? That money could sure go to a lot better things....I'm just frustrated. Finally, last night I saw my cousin singing/playing at a coffee shop which was a nice, relaxing way to end a busy day. Well, I hope to relax and read my book this afternoon...it's a strange one and the way the dialogue is written is very frustrating but I'm liking it. It's called `Blindness'. Have a great Sunday everyone. PS This is written about 4 hours later...Gary and I carpet cleaned tonight, it was kind of fun! (we don't have much carpet so it only took an hour). That book was one of my top 3 EVER favourite books...yes, it is frustrating and convoluted but the journey is worth it. It is a fantastic book.